Since Marco Rubio joined five colleagues, most of them Democrats, last Monday on Capitol Hill to launch a bipartisan campaign for a comprehensive immigration bill, the Florida Republican has become the GOP's top messenger for the most sweeping changes to immigration laws in a generation. But Rubio, a first-generation American born to Cuban immigrants who rose to national prominence with support from the party's conservative base in 2010, has no choir listening to him preach. Everywhere he goes beyond the capital to sell his immigration reform blueprint, which would offer a path to legality for some 11 million undocumented immigrants in exchange for enhanced border security, Rubio faces skeptical audiences. Essentially, one moment he's fighting liberal Democrats to ensure the package contains strictly defined measures to secure the nation's borders, and the next he's sparring with conservatives who have vowed to fight the principles he has agreed to defend. Despite the challenges, however, Rubio's role as El Gran Comunicador of the immigration debate is one he's openly embracing. Since his Jan. 14 interview with the Wall Street Journal in which he outlined a Republican vision for a new immigration law, Rubio has appeared a dozen times on conservative talk radio programs, joined Fox News as a guest seven times, granted four exclusive interviews with right-leaning magazines and newspapers, appeared six times on Spanish-language media and has penned opinion articles that have been published in eight other major newspapers and websites. He has challenged immigration reform skeptics Rush Limbaugh, Mark Levin and Lou Dobbs, and his efforts seem to be paying off. "Why are we doing this?" Limbaugh began in his Jan. 29 interview with Rubio. 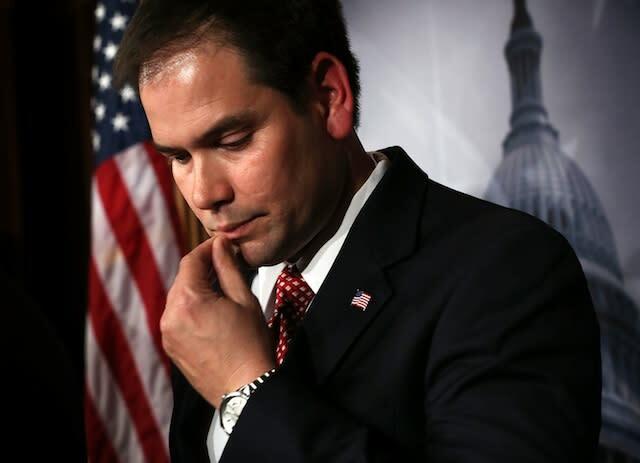 The two went back and forth for several minutes on immigration reform as Rubio made his case. Limbaugh voiced his many concerns. Rubio was sympathetic, but firm. By the end, Rubio may not have made a true believer out of the conservative talker, but he didn't create an enemy, either. It was a start. "Well, what you're doing is admirable and noteworthy," Limbaugh conceded near the end of their discussion. "You are recognizing reality. You're trumpeting it, you're shouting it." Rubio had similar success with Levin, a conservative radio host and author who railed against "statist" calls for "comprehensive immigration reform" in his 2009 book "Liberty and Tyranny." Over the course of two interviews with Rubio on the subject, Levin softened his tone and called Rubio's proposal "more conservative" than the 1986 immigration reform bill signed by President Ronald Reagan. Rubio's efforts to patiently and painstakingly make his case to his own side reveal how important he finds having a conservative coalition on board with him. But it also shows the fragility of the immigration reform effort. Both the left and the right need each other to deal with a reality both view as a serious national problem. For some conservatives, this 41-year-old Senate newbie represents the glue that could hold it all together. But for every prominent conservative like Limbaugh or Levin who have given Rubio at least partial nods of encouragement, there are others standing firm. On Jan. 30, for instance, Rubio faced an entire day of pummeling from his own. In her weekly column, author Ann Coulter ripped Rubio's plan as "a wolf in wolf's clothing," arguing that conservatives would be bamboozled by "amnesty" for illegal immigrants without receiving the necessary amount of border security in return. Meanwhile, the editors of the National Review said Rubio was "wrong to think that an amnesty-and-enforcement bill at this time will end up being anything other than the unbuttered side of a half-a-loaf deal." And in a classic, (but perhaps unintentional) kick-him-while-he's-down moment on the same day, Louisiana Republican Sen. David Vitter called Rubio "amazingly naïve" and "nuts" for trusting Democrats to work with him. The day before, conservative website RedState.com editor Erick Erickson penned an article entitled, bluntly, "I Don't Like Marco Rubio's Plan." Rubio quickly followed up with a counterargument in the same space. And these are his supposed allies. Beyond conservative salons and radio shows, Rubio, as one of the chief proponents of the bill, must also focus his energy on going head-to-head with President Barack Obama, liberal interest groups and labor unions. Although four Democrats signed their names to the immigration reform principles last week that outlined a plan to beef up border security and implement a slow path to legality, there are powerful voices on the left demanding immediate citizenship. Obama, who has deferred to Congress on the issue in the short-term but still retains the most powerful bully pulpit in the nation, has demanded that the final piece of legislation contains a clear earned path to citizenship. Republicans supporting reform, including Rubio, are calling for a plan that allows eventual legal residency that could take decades before an illegal immigrant becomes a citizen. Labor unions are also pushing for quicker citizenship and have vowed to fight against efforts to create a new system of temporary guest worker visas. Rubio must walk a fine line to see the bill through, but he has in recent weeks declared his intention to remain firm on the the border enforcement triggers and the guest worker provision. While he faces his own critics on the right, the battle with the left is not something he's looking forward to. "There's no such thing as an honest policy disagreement with the left anymore," Rubio vented to Levin on his radio show. "If you disagree with them, you're a bad person." With several months left in the immigration process, if Congress wants a comprehensive bill passed, everyone will have to learn to get along.